Tyler tumbled Wednesday while performing during the Sturgis Motorcycle Rally in western South Dakota. Perry gave an in-studio interview at WXRX-FM in Rockford, Illinois, on Friday morning on his way back home to Boston. The guitarist didn't say anything specific about Tyler's condition or say where Tyler was. The rock legend suffered head and shoulder injuries in the fall. "We still don't know if we're going to keep the tour up or what. It's breaking my heart," Perry said in the interview that was also streamed on the Internet. 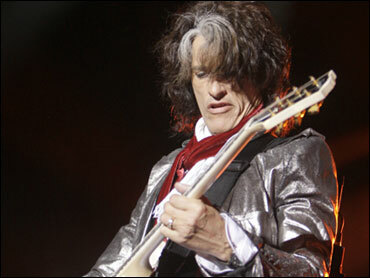 Aerosmith's next concert was scheduled for Friday in Winnipeg, Manitoba, but was postponed. The band's Web site doesn't mention any other cancelations and calls for comment have gone unanswered. Tyler, 61, fell several feet while entertaining the crowd by dancing around as the sound crew replaced a fuse that blew during the song "Love in an Elevator" at the Buffalo Chip Campground, which hosted the Wednesday night concert. An amateur video showed him spinning around before falling off the stage. A concertgoer said Tyler's head was bleeding and he was holding his shoulder after the fall, but it wasn't immediately clear how seriously he was hurt. The frontman was airlifted to Rapid City Regional Hospital, the campground spokesman said, the only major hospital in western South Dakota. A hospital spokeswoman said Friday she would not confirm whether Tyler was there because of privacy laws, and a representative for Aerosmith's publicity firm has said the company was gathering information about the accident. Perry said the band had to cancel only a couple of concerts during its first 25 years but has had a run of bad luck the last three years. On June 28, Tyler hurt his leg at a concert in Uncasville, Connecticut, and the band had to postpone seven shows in July. Tyler also battled pneumonia before the tour began in June, while Perry fought a knee infection. After Tyler's fall, Perry said he decided to ride the tour bus home and stop at radio stations along the way to play some his solo work. "As soon as I knew that the tour was going to get postponed or canceled or whatever, it was, 'all right where's the first radio station I can hit?"' he said.